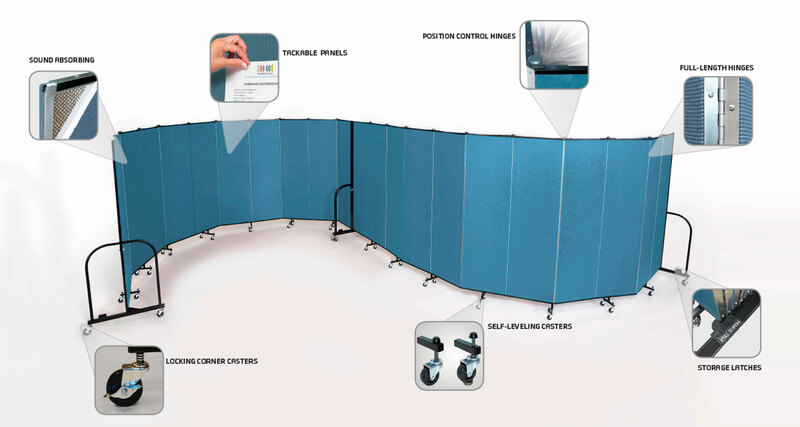 Are Screenflex Room Dividers Environmentally Friendly? Eco-friendly or green products are the buzzwords of today. Screenflex, along with a growing number of consumers and business, cares about the changes happening in our environment. We are trying to do our part by manufacturing 76% of our products from recycled materials. As a result, Screenflex has implemented superb engineering, innovative, patented designs and unparalleled craftsmanship into our room divider design and production. Only the best material goes into making your Screenflex Room Divider. First, a recycled cardboard 3/4 inch closed cell honeycomb creates each Screenflex panel. Second, an environmentally friendly, non-woven fiberglass facing covers both sides of the core for maximum tackability and sound absorbency. Third, a 26-gauge galvanized steel frame surrounds the core to add strength and stability. This process enhances the panel’s tackability, sound absorbing, and strength. Additionally, each panel is covered with one of our 100% recycled polyester 38 fabric or vinyl covering options.